You may have gleaned from my first blog post that my day job is at Microsoft. Well, today two of my babies finally shipped. I am the program manager for the Access Developer Extensions and the Access Runtime. This project surprised us with several unexpected challenges, but we are happy to finally be able to point people at the official downloads. 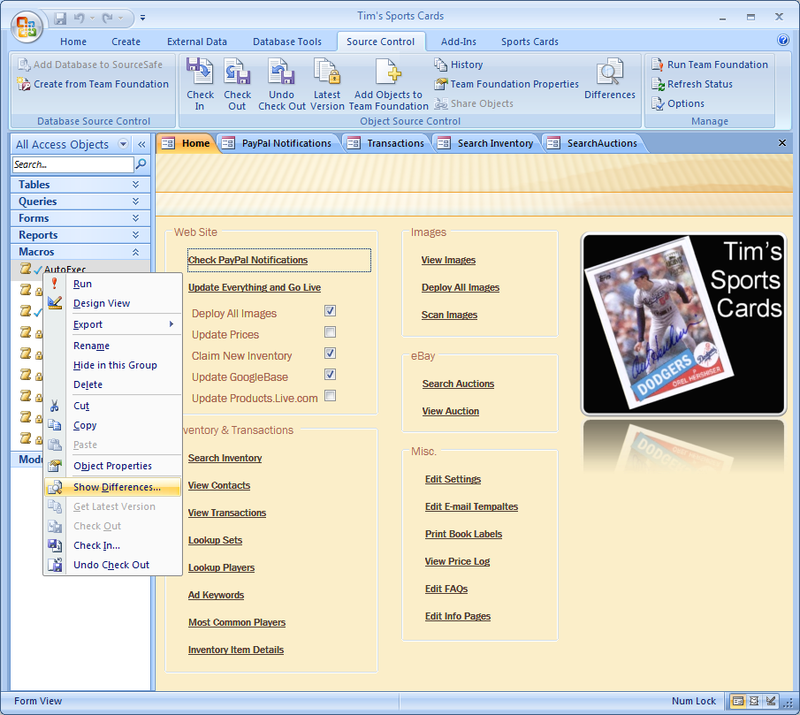 In order to build the COMC.com website, we use many different technologies, but the heart of the site is driven by a Microsoft Access application on top of a couple SQL Server 2005 databases. Andy (or web developer) and I use the Visual Studio Team System to manage all of our source code for the web site, SQL Servers, the Access application, and some managed code DLLs used by the Access application. For the last 4 months, we have been “dogfooding” the Access Developer Extensions’ source code control integration with Access 2007. This allows us to check out, undo check out, and check out individual queries, forms, reports, macros, or modules. My favorite feature is the “Show Differences” right-click command. A lot of times you forget the changes you made to a file, and it is extremely handy to be able to see exactly what changed in a module before checking it in. If you clicked on the screenshot, you may have noticed that we are actually using Team Foundation for our source code control provider. Access actually allows you to use any source code control provider that implements the MSSCCI interface. Typically, small development shops use Microsoft Visual SourceSafe, but if your enterprise has standardized on the Visual Studio Team System, you can install the Team Foundation Server MSSCCI Provider so that your Access databases can be under source code control. This entry was posted in personal life, web development. Bookmark the permalink. Hey, congrats on shipping! Also cool to hear of your dogfooding success. Kudos! On a Team Foundation Server note, does the SourceSafe diff tool support any sort of code merge? PS – That’s a leading question because I have a separate solution that I used on our code line this afternoon. (This was in part ghost-written by Toby who’s sitting my velcro chair). Dave, good question. Yes, Team Foundation does support code merge. However, Access forms, reports, and queries are not merge friendly. Usually you have to manually fix merge conflicts, and that is why Access defaults to only letting multiple people check out VBA modules. VBA merges nicely.